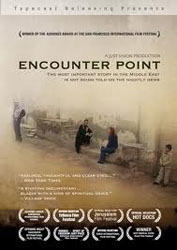 The documentary, Encounter Point, presents a leveled perspective of the Israeli and Palestinian conflict, examining the efforts of individuals and organizations attempting to achieve reconciliation such as the Bereaved Families Forum and Seeds of Peace. The perspectives of the Israelis as well as the Palestinians are discussed in equal measure while giving a cursory overview of many of the more notable characteristics of the conflict including the Israeli security wall, suicide terrorism, security checkpoints, the settler movement, and the lack of dialogue on both sides. While depictions of individuals persuading others to pursue non-violent approaches to the conflict are incredibly important, I question the scalability and ultimate success of such efforts. Organizations that pursue reconciliation offer a pertinent tool to resolving the conflict, but do not address the structural policies that are producing civil unrest and perpetuating the conflict. Applying David Kilcullen’s insights of counterinsurgency and use of complex systems theory, eliminating structural inputs of the situation is critical in achieving peace. While reconciliatory dialogue may overcome boundaries within the system and enable non-violent actors to more effectively operate, this approach may be unable to counter the underlying causes and inputs of the conflict. In short, Encounter Point serves as a brief but noteworthy overview of the conflict, however, caution should be taken in drawing too much optimism from these individuals efforts. Those unfamiliar with the Israel/Palestinian conflict will find the film deeply informative. On the other hand, viewers with a background on this conflict will be left wanting and will not discover anything they haven’t already found elsewhere.